This page is really for general tips associated with books and libraries, however, the main feedback seems to have been in ways to make paper look old. There are several ways to make paper look old, here are just a few. WARNING - several of these suggestions put paper into an oven or uses naked flames; please watch this process very carefully to ensure it does not catch alight. An adult should always be present. First make tea without milk and sugar. Then take the teabag and soak the paper with it. If you are not completely satisfied you can tear the teabag open and smear the contents over the paper.To make it look burned, take a match and set fire to the edges. Be careful to not burn the paper too much, otherwise there will be nothing left of the paper!!! Use water and cocoa powder! 1) Use a sifter and sprinkle cocoa powder over the paper, in a baking pan. 2) Add the water directly over the piece of paper. 3) Put in the oven at 400 degrees, with water and everything. 4) take out after roughly 2-3 minutes. 5) Empty out water and let dry just a bit before putting it in the microwave for a minute. Iron the paper on both sides (put a sheet of plain printer paper over the paper to be aged. The more you iron the darker it gets) then dampen it in water and lightly sprinkle tea over it ( if you don't have loose leaf tea just cut open a tea bag, coffee powder works too but not as well. Get a flannel and put some water and some coffee into it. Squeeze thoroughly and wait for some of the mixture to drain through. Then rub against the paper and put in oven for 4 mins. After that get a match, dampen the centre of your paper so that it doesn't catch a light, hold lighted match under the paper and wait until the desired spot of the paper is to your standard. 1: Get the amount of sauce you need to do a A4 size piece of paper test the soy sauce on a spare or scrap piece first to determine what shade you want. 2: Add water if too dark and if you are doing Calligraphy work I also found lining paper which comes in many grades from light to heavy is great for Calligraphy. If you stain the paper first it will dry fast and you can write over it without the ink bleeding. Walnut Ink - Walnut ink is made from black walnuts. It is usually sold in crystallized form, and must be hydrated before using. Apply the wet walnut ink to the paper, lace, fabric or other material. You can create various effects as you strive to make paper look old. 1: Get a square pan big enough to hold your paper. 2: Make coffee and tea with no sugar or anything else. Mix those two. 3: Pour the liquid into the pan. 4: Lay paper flat in pan. 5: Soak for about 1 minute. 6: Remove, spread on a flat surface. 7: Put in microwave for 10 minutes. Done - effect: old, yellowish, wrinkled. 1. Put lemon juice around the outside. (this goes browner when in the oven). 2.Make a cup of tea without milk or sugar. Use the tea bag and the tea to stain. 3. Put in the oven for ten minutes. 4. take out and burn the edges after damping down the middle part so it doesn't catch alight. You now have an old document. A quick and effective way of making paper look old, is to "paint" The paper with a wet teabag until you get the desired darkness, put paper on a plate, and microwave for 1 minute. Then use matches to brown and char edges. 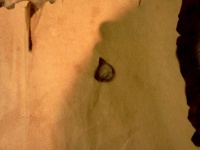 To make old brown spots, hold a match about 2-3 inches below the paper until smoke spots start to appear. Also brown and char edges with matches, and then wrinkle paper by carefully scrunching it into a ball. Use a wet tea bag and soak for about 1 or 2 minutes. I discovered while experimenting for a project that if you soak paper in just enough lemon juice to get your paper wet and to slightly cover the bottom of the pan for about ten minutes and put in the oven at 350 for about ten more minutes the paper looks old and it gives the edges a slightly charred look. Soak paper in pan big enough to hold it and add 9 tea bags (less if you like) to the water. After soaking, cook until given the look you desire. First, you put the paper facedown on a metal cookie sheet with rims. Pour coffee on top (be sure you don't leave any white spots) and put in oven. Once most is evaporated, take it out and dump the rest of coffee out. Bake it for a few more minutes till its crispy then take it out. Spread milk all over the paper and put it in the oven at 360 degrees for a half a hour to a hour. If you tear a small hole close to the side of the paper and burn it with a match then smother it quickly it will make a very authentic look. WARNING - Keep an eye on the paper during these processes in case it catches light! Dab the edges of the paper with water, then use a lighter or candle to char the edges. Rip the sides of the paper then wipe over with a wet tea bag. Put fire around the edges. Make 1 pot of dark coffee with no sugar or milk. Combine it with 5 or more teabags and then leave the coffee to settle for about 2 hours to 2 hours and a half. Then take a paintbrush and paint over the paper with the coffee and tea and then let it dry over night between 2 white pieces of paper. You can make coffee, then, let it cool off, but not for too long, it can’t be cold! Then, pour it on the paper, and let the paper dry, to get an really historic looking paper. If you want to make a document look old, gently wipe it over with an old wet tea bag, then leave to dry. Alternatively, you can burn the edges of the sheet to give it that old "charred" effect. Thanks to Andrew for sending us this one. If you want to add those little brown age spots, sprinkle individual grains of instant coffee onto the paper whilst damp, these will spread giving the really authentic looking mark. Also, ripping the edges all the way around can help to give it an aged look. A hint to making a paper look old would be to drip lemon juice on the edges of the paper and put it in the oven. After soaking it in tea put in the dryer for 1 minute or 30 seconds to make it look crumpled or crumple it by hand. I heard that using an iron will help age paper as well. I put my paper into a cookie sheet and soaked it in tea for 10 minutes or so. After, I put another cookie sheet, slightly smaller, on top of the paper so it wouldn't warp. Then what worked well was putting the cookie sheet over the stove (covering 2 flame...things) 5 minutes and one side of the paper and 5 on the other and it dried it nicely. Again be very careful when putting the tray on the stove or over a flame. May also not be suitable for some ovens. Soak a piece of paper in tea or coffee, then use a very blunt knife to scrape the half dried paper on each side until there is a hole of desired size, then put some aluminium foil under the hole and cover with tea/coffee, soaking until the area around the hole is desired color. Repeat on other side of paper. Use magnate of potash in a very weak dilution, that's if you can obtain it. If you are looking for alternative words or are at a loss for the right word to fit a thought a Thesaurus is invaluable. This is a collection of synonyms on a grand scale. Can you think of a good tip you would like to see here (or anywhere else for that matter)? Send it to us at june@hintsandthings.co.uk and we will add it, mentioning your name of course.